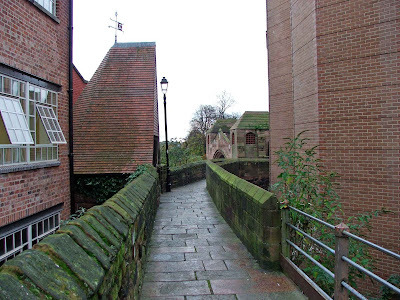 The city wall walk at Chester is easily walkable in under two hours....time enough to walk the whole circuit and stop to examine all the major features along the way. 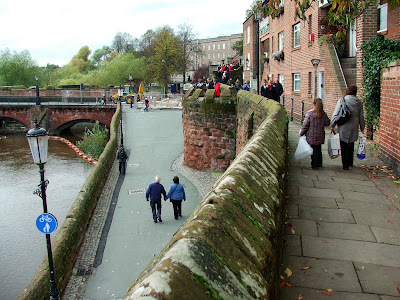 The walk is a revelation, taking you along side the canal, over the main gates into and out of the city of Chester, past towers and along wall walks offering fantastic views of the city and beyond. 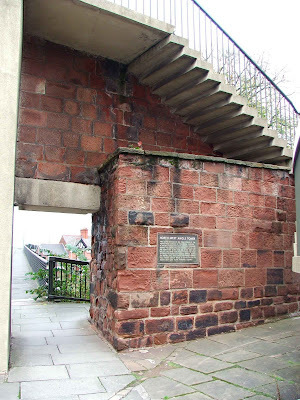 The City of Chester web site offers some excellent maps, detailing not only the walk, but details of the many features that can be seen and the excellent viewing points along the way. 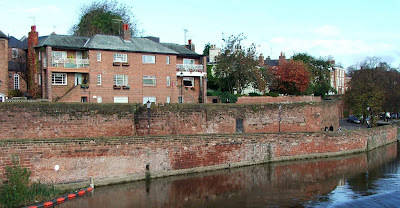 The walls around Chester were first built by the Romans in around 70AD, when the Roman settlement\fort of Deva was founded. At this time, the defences consisted of earthen ramparts, with ditches and embankments protecting the settlement. 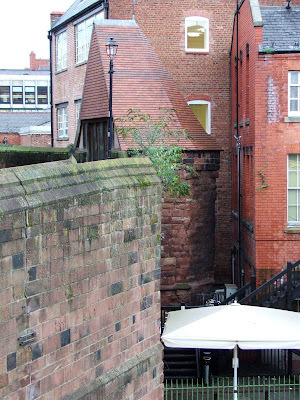 By around 90AD, some of the earthen defences had been rebuilt in stone, utilising the easily quarried red sandstone that is so much in evidence in Chester. There was a long period of neglect, when the rebuilding was halted, and not started again until mid 200AD. The Romans left in around 410AD, leaving the tribes of Britain to their own devices, and into this power vacuum, the Saxons gradually moved, slowly making their dominance felt. 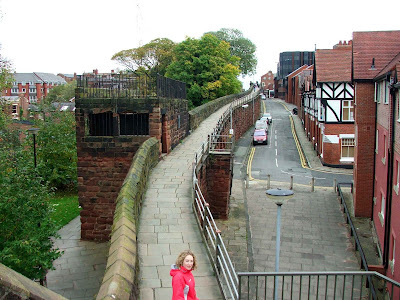 Between 894, and 895, an invading Viking army wintered in the city of Chester, using the Roman defences as a safe haven until Spring 895. 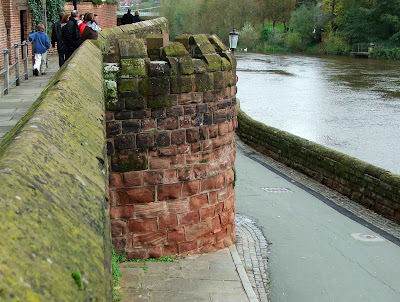 The Vikings moved on, and in 907, Aethelflaed created the Burh of Chester, making it a fortified town, and extending the walls right down to the river side. 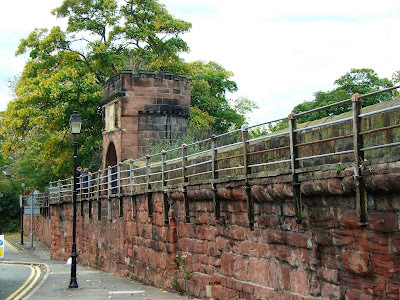 Chester was endowed with a castle in 1070, when William I further fortified the town, with the walls again being extended to the West and the South. 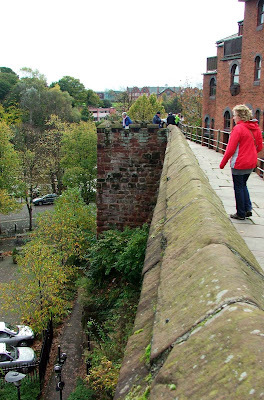 In 1264, buildings deemed too close to the town walls were pulled down, possibly as they were deemed to be threatening the integrity of the town's defences. The castle at this time (around 1282-83) was garrisoned and used as a staging post in Edward I's campaigns in Wales. Between 1322 and the early 1600's a number of towers were constructed, detailed below, to provide points along the walls where watch could be kept and troops stationed in the continued defence of the town. Between the early 1700's and 1966, the town's gateways were gradually demolished and replaced with the gates that we see today. The following details are in no particular order. The water Tower can be found at the junction of Water Tower Street and City Walls Road, to the North West of the city. Built between 1322 and 1326, it is situated at the end of a small stretch of wall, connected to the main wall circuit by Bonewaldesthorne's Tower. It was constructed in the middle of the Dee, a navigable river at the time, and designed to protect the city from river born attacks. The Dee has since receded, and the tower now stands isolated in a small park. 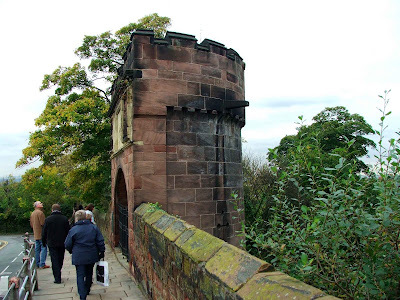 This tower is one of the finest preserved features on the walls, and is easily visible from the wall walk. It reputedly cost £100 to build, and was paid for by John de Helpston. The wall that connects this tower to Bonewaldethorne's tower is thicker than the rest of the city walls, and has an archway penetrating its thickness, in which a portcullis was probably present in earlier times. The tower is open on certain days of the year. The Watch Tower is situated on the South Eastern part of the City Walls, and can be accessed directly from the wall walk. This square tower, of which only the lower portion now survives, was used, during the Civil War, as a sniper point, and as such received much attention from attacking Parliamentarian forces. It is said that the points where canon balls hit the walls can still be seen. What can be seen today, certainly at wall height, is only a portion of what must have been a much larger, taller tower. 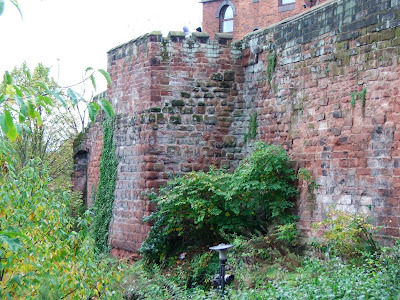 When looked at from the Roman Gardens below, the damaged part of the tower can still be seen, with the repairs bringing the stump of the tower back to wall height. 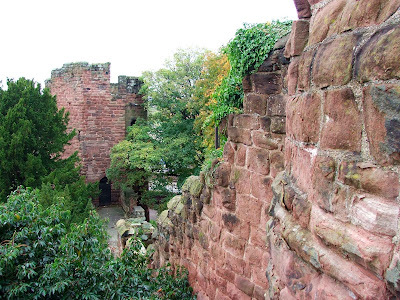 The tower is best viewed from the Roman Gardens below, where the path leads right along the base of the walls. There are great views to be had across the River Dee and to the Church of St John, where the attacking Parliamentarian forces stationed their canons in the bombardment of the city. 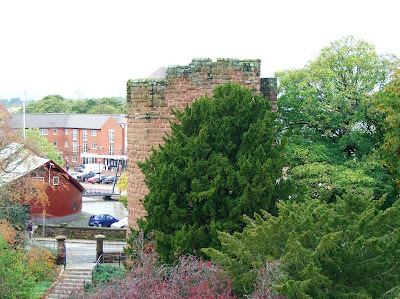 This peculiar little tower, now only really a scrap of its former self, can be found on the Eastern side of the walls, sandwiched between newer buildings and the Roman tower footings. Once called the Wolf Tower (in relation to the Wolf Gate a few hundred yards to its South) the tower appears to have been in a rather poor state of repair. 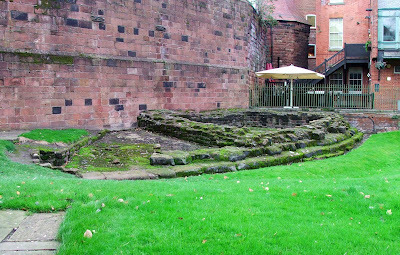 It is best viewed from the road near the Roman Amphitheatre, and is easily missed. Its recent steepled roof (added in 1994) doesn't immediately indicate it's age, but peering through the windows whilst walking past on the walls, the interior can be tantalisingly glimpsed through the dirty glass. It's a difficult tower to photograph, as can be seen here. Like the Watch Tower, what is seen today is only a portion, height wise, of the original tower. The tower probably dates from the 13th century, and was partially destroyed during the Civil War when the city was besieged. It was probably a drum tower, when complete and in use, but not much remains of it now. 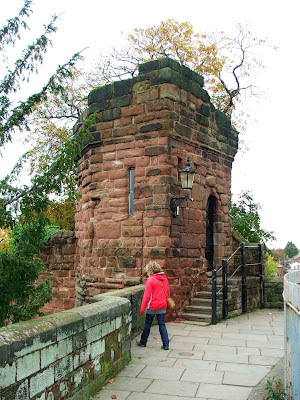 The Round Tower can be found at the South of the city walls, and overlooks the River Dee and the Old Dee bridge on the Groves. The tower was again probably built in the 13th century, and what can be seen today is only a small portion of the original structure. The crenellations date only from the 19th century, and the tower was dropped in height in 1876\87 as part of the development of the wall walk. The tower affords excellent views out across the River Dee. This Roman tower can be found between Thimbleby's Tower and the Wolf Gate, at the South East of the city walls, just across the road from the Roman Amphitheatre. The footings, excavated in 1930, probably date from somewhere between the late 1st century to the early 2nd century. The ditches in front of this small portion of Roman remains have been dug out to demonstrate the extent of the Roman defences. 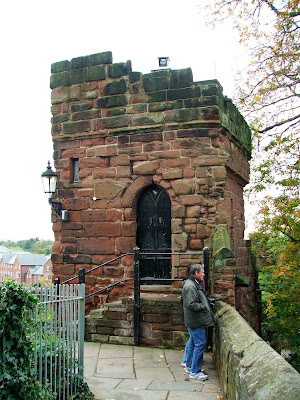 This tower can be found at the North end of the city walls, along Water Tower Street. It can be viewed from the wall walk, and from the street some 12 to 15 feet below. This 18th century tower, sits on the site of an original drum tower, originally referred to as the Goblin Tower, and the Dille's Tower. The original medieval tower would have been much taller than the current structure, almost twice as high in fact, and was demolished between 1702 and 1708, with its replacement being erected in 1894. It's thought that this tower got its name from John Pemberton, who may have once stood on here watching his workmen working below the city walls in his rope works. 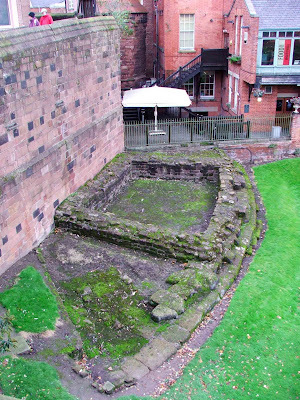 This spot, beneath St Martin's Gate, represents the position of the North West corner tower of the Roman fortress. 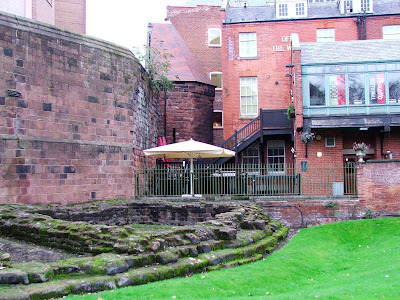 It was probably built around 103AD, and was only discovered in 1965, when St Martin's Gate was being erected. Measuring 30 feet by 27 feet, this almost square tower had walls some 4 feet thick. 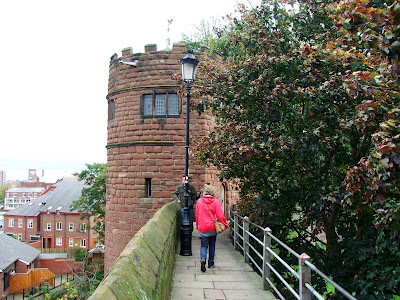 Situated on the North part of the city walls, along Water Tower Street, this tower can be viewed from the wall walk, and from the road below it. Indeed, a great view of it can be had as you cross St Martin's Gate. 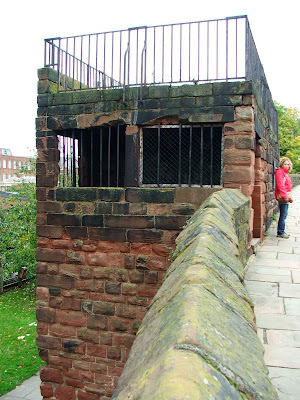 Built in 1640, on the site of an earlier tower, it was used during the Civil War as a gun emplacement supposedly by Captain William Morgan or his son Edward Morgan, to direct fire against the Parliamentarian forces besieging Chester. It was originally, and imaginatively, called The Raised Square Platform. 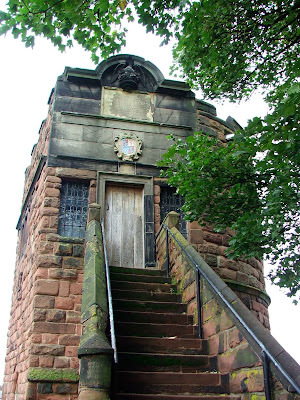 This tower was also known as Newton's Tower, but it's most popular name, King Charles' Tower, probably came about due to the local legend that King Charles I stood at its summit and watched his army being routed on Rowton Moor in 1645. It was probably originally built sometime in the 13th century, but has undergone many rebuilds and repairs since then. It was severely damaged in the 18 month siege (between 1644 and 1646), and largely rebuilt in 1658, with more repairs and changes taking place in the 18th, 19th and 20th centuries. Above the doorway, at the top of a small flight of stairs, the Royal coat of arms can be seen, together with a memorial plaque commemorating the defeat of King Charles' army. 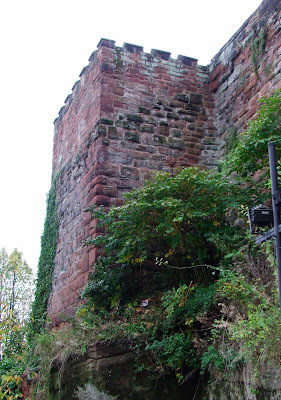 This tower can found at the Northern tip of the city walls, and would originally have stood along side the river Dee. It is linked by a short stretch of wall to the Water Tower (see above) It can be viewed from the wall walk, from the West and from the South. This tower is linked with the 11th and 12th century extension of the city walls, and probably stands on foundations from this date. It was, like so much of the masonry on this walk, damaged during the Civil War, and repaired thereafter. The tower now houses a camera obscura and is open on certain days of the year.